You’re never too far away for a massive PC sale, whether it’s Steam or Green Man Gaming’s seasonal price slashing or GOG’s massive reductions across most of its library. Games you’ve been too broke to buy or you simply aren’t sure about become within your grasp or safer bets, and pretty quickly your digital libraries grows into a behemoth. But it’s not all rainbows and unicorn kisses. 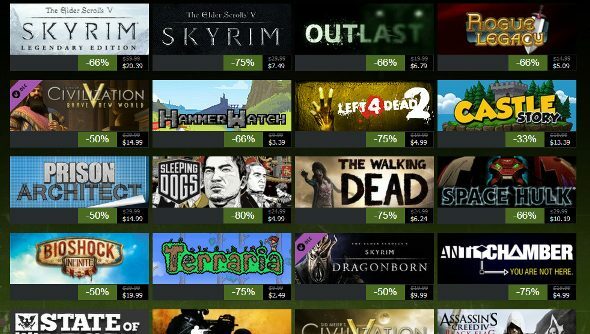 There are concerns that frequent sales devalue games and stop consumers from purchasing at launch, limiting the chances of developers, especially of the indie variety, from being able to make further games. Positech Games’ straight shooting Cliff Harris (Democracy 3, Gratuitous Space Battles) has weighed in on the subject in a blog post, and he makes no bones about his dislike of the trend. “[I]t’s a bad thing, and if we can (and I think we probably can’t) we should stop it,” he says. When a game costs only $5, it’s easy to just buy it without doing any research. I’ve done it myself. I bought a four-pack of Orion: Dino Horde the other week because it was dirt cheap. All I knew was that it was terrible at launch, had improved considerably and had dinosaurs. I was sold. I played for an hour and promptly uninstalled it. Not one single element was explained, I’d be controlling dinosaurs that couldn’t attack while trying to figure out what the objectives were before being shot and unable to defend myself. Maybe it’s a laugh when you know what you’re doing, but I didn’t get a chance to understand it before becoming incredibly bored and frustrated. I uninstalled it and won’t play again. It doesn’t matter, I thought to myself, because I only spent a few quid. As Cliff sees it, though, I just rewarded a game with a purchase purely because it was cheap. And that’s pretty much the truth. It promotes bargains over quality. I don’t see sales as entirely destructive. They can be a good way to promote a game that otherwise gets buried under larger releases, and I think that, despite what Cliff says, we can still have those “water cooler moments”, especially when games launch with 10 percent discounts to encourage launch day purchases. Then again, I talk and write about games for a living, so I’m always trying to engage with people about new titles. But I have made a more of an effort over the last year to pick up more titles before they go on sale. If a title piques my interest, I don’t want to wait for it to get cheap before I enjoy it. Sales aren’t going anywhere, but that doesn’t mean we always have to wait for them.